Jay Reatard, “A Clockwork Orange,” and a hike by full moon -- with marshmallows! 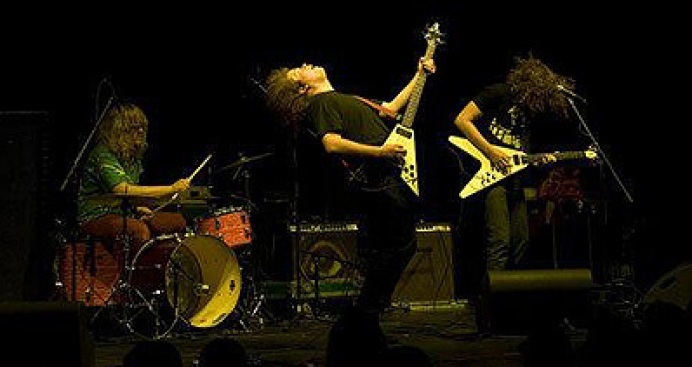 Jay Reatard starts your holiday weekend off right. REATARDED: Jay Reatard’s Memphis roots don’t quite peek through his go-go garage-punk sound, but who cares when all you want to do is mosh? Expect plenty of unabashed raucousness at his Music Hall of Williamsburg show, 8PM. RHYMES WITH ORANGE: We owe a lot to Stanley Kubrick’s “A Clockwork Orange”: a certain mod aesthetic, the resurgent popularity of bowler hats (we’ll also give that to “Cabaret”), and the inability to ever listen to “Singin’ in the Rain” the same way again. If you don’t get that last reference, then you really need to see the movie, playing tonight and tomorrow at IFC Midnights, 12AM. MOONING: If you’re not going anywhere fun this holiday weekend, you can at least soak up some nature with a Full Moon Night Hike at Harriman State Park. There’ll be a campfire, so refresh your lyrics to “On Top of Spaghetti” before the bus picks you up (at the corner of 96th and Broadway) and drives you north. 8PM.